Despite suffering a number of defeats in their opening fixtures this season, Lancaster University Rugby League are looking onwards and upwards for the rest of the year. 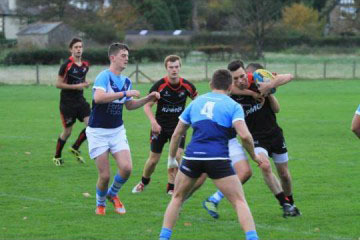 On Wednesday Week 6, despite tries from Marcus Heath, Mark Brown, and Sam Hudson, the tireless efforts of the whole team were unable to stop a closely fought 22-14 defeat at the hands of Newcastle University in the cup on Wednesday Week 6. Although the team have lost their first three matches this year, they clearly believe that their season can still be successful following a tough opening fixture list. The team have not just been in the spotlight on the pitch, but off it as well. They became the centre of debate regarding the ethical sponsorship of sports teams after gaining a sponsorship deal with KPMG, a company deemed unethical because of past involvement with tax evasion schemes. Russell said that whilst it is completely fair that there is policy to ensure sponsors are deemed ethical, the Rugby League team took issue with the “lack of communication” they experienced with LUSU.